For whatever reason, I have always been a bit averse to short stories. Many of them are simply less gratifying than an entire novel. Given the brevity of the short story, character development is limited, and authors generally use short stories as a time to either flaunt their abilities to craft beautiful prose and flex their ‘shocking plot twist’ muscles—a novel has room for both. Or so I thought. My first brush with the successful short story was in 2013. I was flying home from Africa, and the book I had planned to read on the plane (Wolf Hall) was weighing down my carry-on to the extent that I abandoned it before security. I only had about an hour to replace it, and I quickly settled on Nine Inches, a collection of short stories by one of my favorites, the truly quintessential American author Tom Perotta (if you’re not familiar with him, he wrote the books that the movie Election and the HBO show The Leftovers were based on. In both cases, the book is significantly better). The stories were perfect: bite-sized versions of Perotta’s books, and, believe it or not, they capably conveyed both a skill for crafting excellent prose and a penchant for plot twists. I came to the conclusion that I had simply been reading shorts by the wrong authors…and then proceeded not to find another book short stories I enjoyed until last week. Alice Munro has been heralded as the master of the short story, so when I picked this book up at Barnes & Noble a few weeks back, I knew it was in good hands. I had a busy week ahead, followed by the holiday weekend, and I figured short stories would be perfect for picking up and putting down as I pleased. 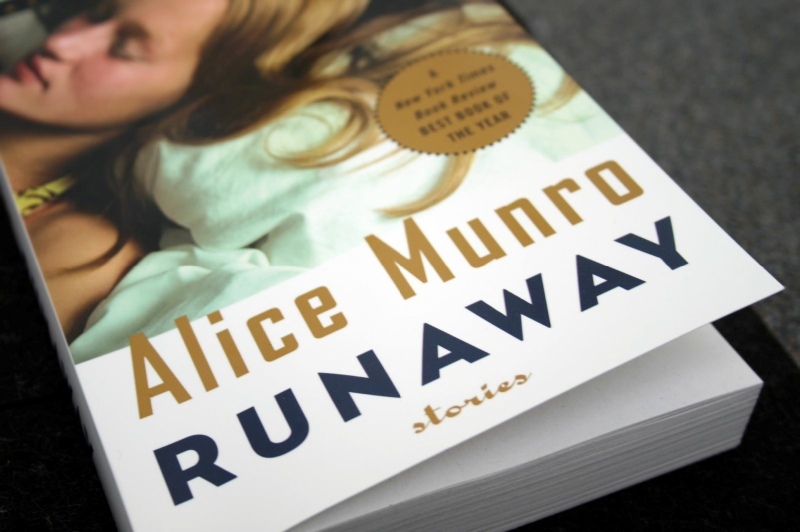 Once I started Munro’s Runaway, though, I quickly discovered there would be no “putting down” until I was finished. Munro is a Canadian author, so all of the stories take place in locales with which I am unfamiliar, although most stories seemed to take place in rural Canadian areas akin to certain counties in the United States’ West/Midwest region (apart from Toronto and Vancouver, cities with which I am obviously familiar). While each story stands alone, certain characters weave their way in and out of multiple narratives; starring in one story, absent from the next, and a guest star or side character a few stories later. Because the stories do not share a common narrative thread, I can’t exactly summarize them all, but “family structure, family secrets” seems a favorite theme of Munro’s, present in some way within every story. There are stories about the rivalry between sisters, the slow, sad disintegration of stale marriages, adoption, adultery, and almost everything in between. Though I’ll admit to a few audible gasps here and there, it was Munro’s writing, and her unparalleled ability to transport the reader (as I mentioned, I’ve never traveled to the areas of Canada about which she writes) that truly made a fan out of me. Buy it here.